This is my backup chair, a Quickie GPV. I replaced the existing 37-540 tires with Kenda 2″ knobbies (50-540). I figured out that it would be ok to mount them on the existing wheels by reading Sheldon Brown’s article on tire sizing. Thanks to this, I didn’t need to buy new wheels (expensive!) or worry about the axles. Then I replaced the 5″ hard roll casters with 6 x 1.25 soft roll casters. This raised the front end of the seat up about half an inch, which is fine, because the chair doesn’t have enough dump as it is. It also meant that the caster barrel housings had to be re-aligned to be vertical – my beloved did that, because his tools are cooler and he’s better at precision than I am. I found that the knobby tires were intruding into, shall we say, my personal space a little bit, so I increased the axle spacing. That made the chair 27.5 inches wide from handrim to handrim, sadly. I’m going to get rid of the camber (currently 3 degrees), which should allow me to bring that back in about 1/2 an inch on each side. I took it out to the park last week, and definitely noticed a difference over bumps and grass – I didn’t have to wheelie up once going across the grass. Nice. Sweet. And pink, too. Knock’em out. Except that it’s really red – lousy cell phone camera. But red is good, too! Looks great! Have a great time outdooring and please let us know how the tricks worked. Consider getting very thick gloves for this, the wheels will pick up detritus from the trails that may open up some fairly nasty wounds. Just popping in to say I can’t thank you enough for all the wheelchair posts. Were it not for this site, I wouldn’t have had the first idea where to start. 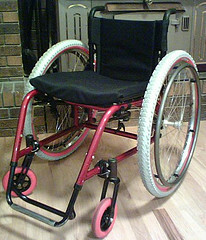 I’m planning on breaking MY wheelchair cherry with a pretty major purchase, so yeah… thanks again! mdmhvonpa – how’d you get so smart? I wound up putting my husband’s leather work gloves over my regular bike gloves. Retired Waif – breaking your what? :-) Hope you find something wonderful (and I hope the baby comes soon!). Will post on camping adventures soon. Nice job on the ‘chair mods! I’ve done similar mods to my Quickie Ti for off-roading: bigger soft-roll casters, 24×2″ knobbys, etc. The Ti, like the GPV, is quite easy to adjust and I’m fortunate to have two sets of wheels, so it’s easy to convert from off-road to on-road for weekend and everyday use. My friend and I do hiking trails with our chairs setup like this. It’s hard work, but a blast! I’m in-process of ordering a TiLite. As soon as it gets here, I’m going radical with mods on the Quickie for pushing trails! hey there, take my advice, an action trackchair would be way better for disabled camping, check it out!